Do you have a go-to devotional book, one that you use so much that you want to carry it around with you? 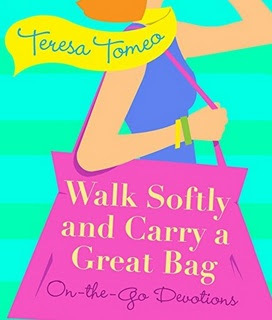 If you don’t, I recommend Teresa Tomeo’s new devotional, Walk Softly and Carry a Great Bag. You’re not too busy to read this book; the longest chapter is only 4 pages long. But while the chapters are short, they give you plenty to think–and pray–about. Author, talk-show host and motivational speaker Teresa Tomeo doesn’t get too heavy-handed in this book. She brings along plenty of humor while driving home practical encouragement. Each chapter begins with a Scripture quote and ends with a prayer prompt. Her confidence, energy and great sense of humor shine through on every page and provide inspiration and out-loud laughter. 1. As a devotional, this book is different in focus from your previous books. What was the hardest part about writing this type of book? Actually this book wasn’t really hard to write. It was a lot of fun and because we were and are trying to reach Christians at a variety of faith levels it allowed me to include different types of analogies and reflections: analogies and reflections I might not use for a specifically Catholic book. 2. What was the best part about writing this type of book? Creating the titles from popular and well known sayings and cliches. As I go through the book again I can even see some more book ideas developing from the different chapter titles. 3. Which chapter is your favorite and why? I can’t say that I have a favorite chapter: maybe a favorite topic or area of interest in the book would be more appropriate. I really enjoy helping people connect the dots in terms of what is happening in the world and help them see how truth in nature, science, experience so beautifully back up Catholic teaching. So Give It a Test Already and If All the Women Jumped Off a Bridge Would You Jump Too? would fit nicely into those categories. 4. How did you choose the Scripture quotes used in the book? Were those writing/prayer prompts as you wrote the reflections? Yes I was prompted quite often during the writing of the manuscript but many of the verses used were already favorite verses of mine that I quote in my motivational presentations especially my personal testimony. They are verses to which many women can relate given the craziness of the world right now and the continued pressure for women to be all things to all people. A great bag is one that is versatile: a bag that will get you from day to evening. I love patent leather and black patent in particular. Always classic and stylish and very Italian chic! A great bag is also practical allowing you to fit in more than just a lipstick and some tissue. A great bag is one that you love and always go back to time and time again much like the basic black dress or the classic pumps that never go out of style. Here’s my own “great bag” with plenty of room for this terrific little book. This book’s small format makes it the perfect size to tuck into your favorite bag, so it’ll be right at hand whenever you have a few free moments. 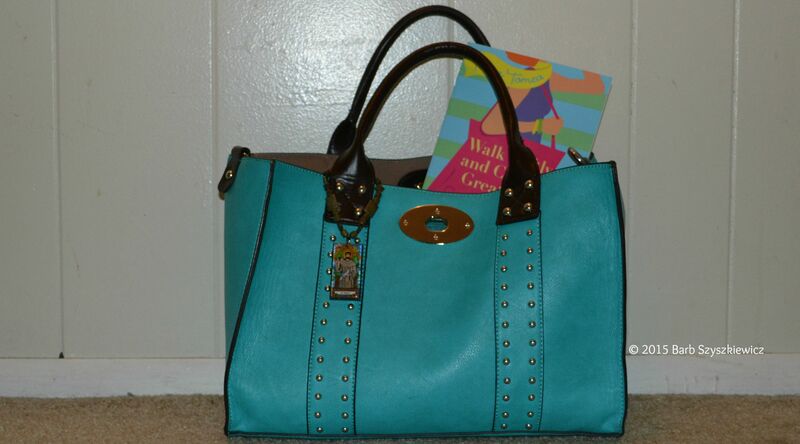 Walk Softly and Carry a Great Bag is excellent reading for Adoration AND the carpool line. Your purchase of this book through my affiliate link helps defray the costs of hosting this website. Thanks! Photo copyright 2015 Barb Szyszkiewicz. All rights reserved.